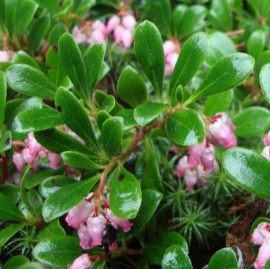 Kinnikinnik (Arctostaphylos uva-ursi) - Encourages you to gently snuggle into open-hearted love for yourself. Opens the back of the heart chakra and instills the will to stay focused in unconditional love during daily life. I am ease with unconditionally loving myself and others. 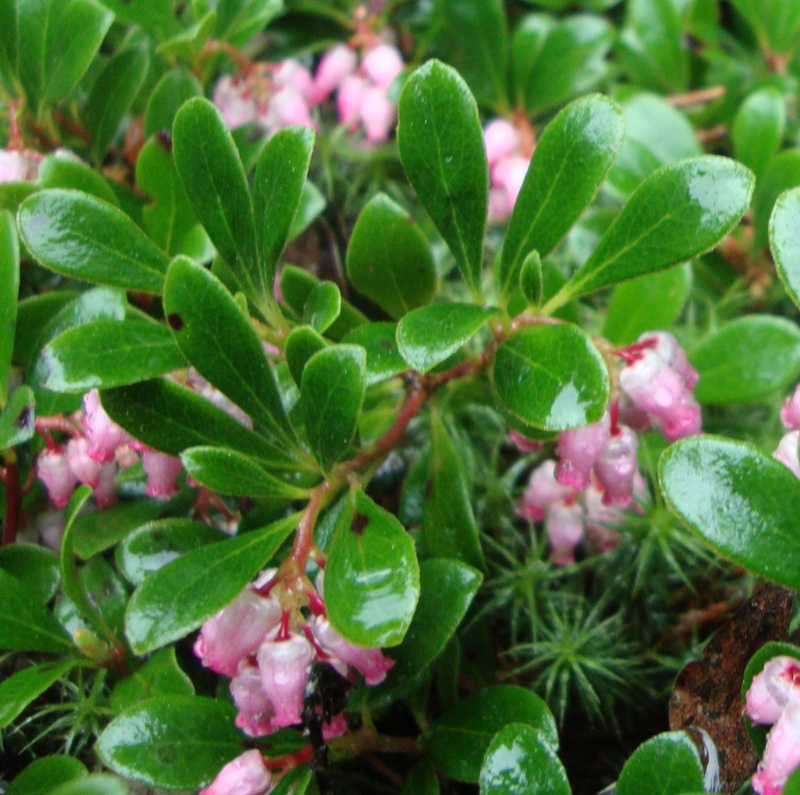 Uva ursi is also known as bearberry. It grows wild in dry sunny spots throughout northern Europe and Asia, Greenland, and in North America in the Appalachian Mountains, High Sierras, Rockies and along the west coast to Alaska. The name kinnikinnik (also spelled kinnikinnick) comes from the Algonquian Native American language and means “smoking mixture”. The evergreen leaves were smoked by a number of Pacific coastal native groups including Salish, Haida and Nuxalk who made special pipes from gooseberry stems. It was also used by the Haida as a diuretic in kidney disease and to treat infections in the urinary tract. Among present day herbalists, it is best known for treating urinary bacterial infections. When the back of heart chakra is sluggish and narrowed, you lose your connection to unconditional love for yourself and others. Life feels dull and constricted. Lack of self-love can lead to many conditions including addictions, heart disease and auto-immune disorders. Kinnikinnik Flower Essence gently opens the back of the heart chakra and supports the process of returning to unconditional self-love. It instills the will to open-heartedly accept and love others, which leads to a vibrant, expansive life. For additional support in opening the heart chakra, use Kinnikinnik in combination with Cherry Festival Tree Peony Flower Essence. Kinnikinnik Essence in combination with Oregon Grape, Stinging Nettle and Mock Orange Flower Essences will assist your efforts to shift from addictive behaviors to a healthy life style. All of our Fire Element Organ Energy Meridian Blends also work on heart-related issues. All except Small Intestine contain Kinnikinnik. Use Kinnikinnik along with Small Intestine Organ Energy Blend. Kinnikinnik Flower Essence was made by the no-pick method of working directly with the plant spirit. While the essence was being made crystals of amber, adamite, amethyst, drusy quartz, icosahedron cut quartz, mangano calcite, morganite, pink cobalto calcite (clear), quartz points, rhodochrosite, rhodonite, and rose quartz were placed among the plants with the storage (mother) bottles. The sun acts as a transformer to step down spiritual energies from higher dimensions. While the essence was being made, Amber acted as a lens to receive and focus sunlight for this purpose. Amber aligns the subtle bodies with the physical bodies, transmutes negative energy into positive energy, emits a sunny and soothing energy that calms and enlivens the disposition. Adamite assists maintaining a positive, loving, vibrant and heart-centered energy field. It aligns the heart and solar plexus chakras to harmonize your will and your feelings and encourages you to follow your joy. Amethyst clears the aura, transmutes dysfunctional energy located in the body, brings peace and contentment, and enhances cooperation between the subtle bodies, spiritual energies and daily life. Drusy quartz crystals help to energize and stabilize your subtle bodies. The actions of the crystals inform the way this flower essence seats into the physical body. Icosahedron cut quartz has 20 (5X4) equilateral sides. It is a bridge between the 5th Dimension - the entry into the unified Spiritual realms - and the 4 cardinal directions (N, S, E, W) on Earth. Mangano calcite is the gentlest of all calcites. It heals grief, soothes emotional heart wounds and comforts with unconditional love. Morganite opens your heart to the level of Cosmic Love that is all around us. It strengthens the heart’s energy field and teaches protection through love instead of fear. Pink cobalto calcite (clear) embodies deeply compassionate, unconditional love and acceptance, while balancing your feeling-oriented and action-oriented aspects. Quartz points open and clear all chakras and energy pathways, and clear and expand the energy fields. Rhodochrosite gently aids with healing past wounds, rediscovering self-love and embracing joy with a courageous heart. Rhodonite carries the qualities of love, compassion, and generosity. It instills self-worth and helps to strengthen the call to your spiritual path. Rose quartz encourages gentleness, emotional healing, and uniting with the Divine; it shifts your body from a stress-based physiology to a higher frequency Love-based physiology. The sounds of rattle and spirit song coming through Diana's voice were imprinted into the Kinnikinnik Flower Essence while it was being made.